So i did a quick search on the database here and didn't find much on the Jason model refractor telescopes, i did find some on the Tasco type which resembles it. I decided to make a post about it here at CN. So my dad has had the Jason model 311 constellation telescope since the 70's, and its the first one i had ever used. All the marking are made in Japan. I saw saturn through it and fell in love with astronomy since then. Ive been thinking of getting a refractor telescope to add to my collection but am very undeceive on which to get and I'm doing my research first. Im looking for something that is very portable and i can travel with on planes and such. i can't do it with the jason as its to long or id happily clean it up and bring it on with me. Recently i haven't been wanting to lug my 130mm reflector around (my first & only scope). So tonight I pulled this out, finding that the diangle had completely fell apart, I ordered a new one and its on its way. I still decided to see what the view would be like. It is a fairly cloudy night out but was still able to see jupiter and the moons. Also to note, I was able to see three little moons that were much closer then the four moons i normally see. This is a 60mm, 700mm focal length old school refractor on a wooden tripod. My dad said when he used it, he was able to see Neptune's colour, and m45 back in the day. 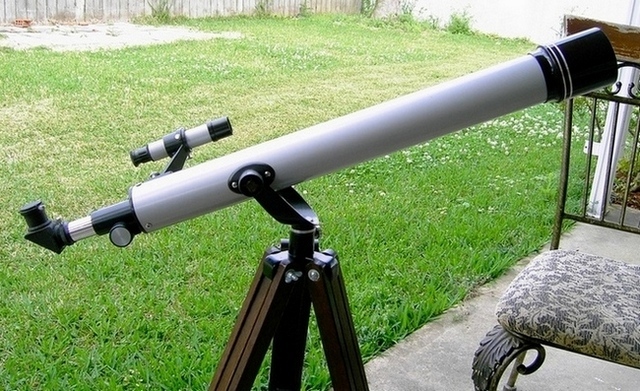 Im curious about this telescope because the views I've gotten from it are much "cleaner" and vivid then with the reflector i have and its only 60mm in diameter compared to the 130mm reflector. With the barlow on it, its about the same size to. Aaron, just like boats, you can always sink infinite amounts of money into getting bigger and better telescopes. There are some worse and quite a few better refractor scopes to be had for viewing DSO's, but they wont have the family connection this one has. You can see a lot of objects in a scope of this size. On the con side, It's a lot harder to use and see things. It's just never going to look like the photos from the Hubble and some of the fainter DSO will be invisible to you. its very likely the neighborhood and urban light is brighter now than then, drowning out the view so you dont see with it as well as back in the day when the hood was a little darker at night. If you want a refractor for grab and go and DSO a short focus refractor with a bigger diameter might do better than a 60mm in general. Astronomical Binoculars can be had that do a pretty good job and are very portable. But you still need a tripod coz those suckers get heavy after awhile. thanks for the input dgreyson. Thats true about the family connection, and how it must have been darker when he use to look through it. I can only imagine holding some Astronomical binoculars out in the field, i wouldn't have to work on my curls as much! In fact this is the one i ordered, as i have a 1.25" orion EP kit, and its really hard for me to view through the .965" EP's. After i posted that last one i went out again with it and the sky had cleared where Jupiter, the Pliedies, and the orion nebula was. I was able to view each of them without the diangle, to get them in focus through i had to use the 2x barlow. Is this common, without the diagonal i need to use the 1.5x image erector or 2x barlow to get it in focus? also ive noticed there is little dots in the field of view, would getting some optical wipes and cleaning the lenses take care of this or is it from the Lens coatings? On most Japanese scope for both terrestrial and astronomical work there should be a drawtube that slides out of the focuser to give you more or less distance to help focus. Yours may not have one. short extension tubes to give you a little more length can be bought for 1.25, dunno about .965 as they usually have a built in drawtube to do the same thing. Try never to wipe the lenses as you can scratch the lens and over time, wear off the optical antireflective coatings. Staples and other office supply places sell compressed air in a can for blowing dust off things. stubborn stuff can be brushed off with a soft unused makup brush from wallgreens. I have one of those brushes for cleaning lenses( this came with a projector). it does have a draw tube to focus, but doesnt do much with just the eyepiece, like if i extended it out all the way or in all the way its the same. I need to put the barlow on it to get it in focus, so im hoping its just some random thing that happens. I know when i used the diangle last time it worked just fine getting into focus. All the same, the new .965 to 1.25 90* diangle should be here this week some time so if im luckily i may have it for the weekend for a magnification test with the 130mm space probe. I like my Jason Model #311. It throws up some good images.This is my second one .The focuser however has a small travel distance of about 2",and I like that you have gotten a hybrid diagonal for your scope. Eyepieces are important,but the included ones do ok though their small fields of view can be problematic. Here's a photo of mine.Also ,be careful to fix that diangle that fell off!! Wow ... that photo brings back some memories. I got into astronomy at the same time my buddy across the street did. (1976.) I had my 60mm Sears refractor, and he had that Jason 311. Dunno how to say it ... that 311 was one of the most "balanced," attractive-looking small refractors I've ever seen. He's long since become an interior designer and moved to NYC, but his Dad still lives across the street from my Dad. I'll bet that scope is still in that house somewhere. Just one comment -- the finderscope bracket is on backward. Can't believe I found the manual online ... check the diagram on page 3. Great condition of that scope BarabinoSr! Ive tried alot with that diangle to repair it but it still falls apart! I did a bit more research on the scope, I guess the markings "double V" make it pre vixion? Its amazing how some of the older stuff sticks around and is still sought after. In my experience, with as little field time I've had with scope, its taught me more about astronomy than anything else so far! Im not sure if the 14 pass means only 14 got through the inspection or what, I'm surprised that sticker is still on it after all these years! I believe it was bought new, late 60's early 70's possibly around '68. It also had a tray holder but has since been lost. I got the hybrid diangle tonight, not the greatest of quality. Its made from plastic, but will test it out and see how it performs, as always when new astronomical equipment arrives its cloudy for about a week! Im actually starting to enjoy this scope, i can easily move it around and there is essentially no setup required! is it worth my finagling around with? Absolutely. No matter what other scopes you'll ever have, you will never outgrow the need for a good small refractor (especially one with family ties). As an example, at a public star party, a crowd was awed at learning that Venus had phases, yet Venus was dropping behind the trees faster than everyone could have a look... and then a second, and a third look. No problem! I grabbed my Jason 313 (an equatorially mounted scope otherwise similar to yours, but of longer focal length), and carried it far across the field. It was lightweight enough to carry quickly, and to set up quickly as well, because I could flip it around with one hand while adjusting the legs with the other for the uneven ground. I can't promise that I would have been so devoted to my crowd as to move fifty pounds of large reflector so far across the field, after it was already in polar alignment on its pad by our observatory. The scope I took was easy, truly "grab-and-go." Moreover, you'll not see detail on Venus with any scope, but only the phase, so this little gem was as good as anything bigger. So, YES! You will always keep and use your small refractor, no matter what other scopes come your way. +1 There are obstructions on my land and during the course of an observing session objects will hide behind a tree, powerline , or someting of the sort and I can just pick up my small refractor and move a few feet and be observing again in a few seconds. Not so easy to do with my dob. I will always have a small refractor on hand for quick observing. I don't know what I would do without it. True, ive found this out tonight when it was freezing cold out and wanted to get at the moon before it went down past the neighbors house. I was able to move it across the yard and get it before it went below. Then i moved it back to get at Jupiter. The Tasco hybrid diangle is far from a decently made piece of equipment, but it works great for the job. may have a look around for a better made diangle and really clean this scope up for another 30 years of use! This scope has is pros and cons, and really viewing jupiter with it and the moon, compared to my reflector i can honestly say that a refractor is much better than( cleaner image) a reflector. at low magnification it did very well with a nice FOV, and high magnification it did well, some where in between is where i noticed the blue and purple hazes, not so much to be annoy but defiantly enough to distort the image. Ill keep this scope on the go, bring it out with me to my dark sky location and test it out again, maybe when it warms up some more. I was just given one of these Jason 311's today by a friend who has had it just sitting in her garage or basement for YEARS. It cleaned up fairly well, but i"ll have to get a hybrid diagonal for it, as it only came with the OTA, mount/wood tripod and the finderscope bracket. How can I remove the lens elements to clean inside? It has sat with the focuser open all this time and there's quite a bit of dust and such on the backside of the lens. Also, what finderscope would work well with this? I've order a hyrbid diagonal for it, so we'll see what it does in a few days. It's one of the Towa made scopes with the Circle-T and the tube is painted a gray/silver color. Hatter, cleaning the old eyepieces is in itself an art, but if you're seeing dust in the field of view it most likely will be on the field lens of the eyepiece ( the lens nearest the objective lens) if you're using the stock ones that were supplied with the scope originally Huyghens H then the f/l in millimeters (mm). You should be able to get that dust off. Jeff, the hybrid diagonal will work fine. I have quite a few 60mms with the short drawtube , which allows only slightly more than 2 inches of focus travel. I bought me one and it works great. Jeff , the objective lens cell is threaded to the tube, so it may be unscrewed and removed for cleaning. Just remember to replace it carefully and slowly, because its easy to damage the tube thread by cross-threading it. Be careful when cleaning the lenses . From your description the dust could be removed with a camel's hair brush. My $20.00 find over the weekend. Well, one of them. I just figured I would post it here, making this a dedicated Jason 311 thread. Optics were kept very clean. Minor nick on tube is all. I cannot find the serial on the OTA, but I do have the red notched ring on the focusing tube. I got the lens cell removed and the lenses removed and gently cleaned. Then last night I finally had a break in the clouds where I could try it out. Stars were sharp pinpoints of light and the moon was also beautifully sharp. This with a no-name prism hybrid diagonal off of ebay and a Celestron/Vixen 25mm ortho ep. This is going to be a nice scope for quick setup and views.